Sean Griffin - Classic or Classy Superbiker? I am racing in the Classic Superbike Championship since its inception in 2014 on a 1993 Yamaha YZF750R and am from Cork. I am 50 years of age since October last year so probably should have more sense but it’s an itch I had since I was 21 and eventually it had to be scratched. I began doing trackdays since 2000 and various hillclimbs around cork including drag racing etc. My first foray into trackdays was on a Yamaha 350 YPVS motor in a Honda VT 250 chassis which was interesting to say the least. 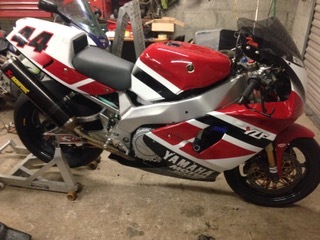 I then moved on to a VFR 400 that I converted into a trackbike and had some great times on that torturing R6s in Mondello. I eventually moved up to a 1992 Tony Scott powered CBR 600 which I promptly crashed and wrecked, back to road bikes and a 04 ZX10 and lots of trackdays on various tracks in England. Then I stopped doing anything with trackdays in 2011 due to the financial meltdown we all had to endure. Then at a race meeting in Mondello 2013 I met Mike Meskell spectating and got talking and next thing I knew I was on the grid in 2014. Fast forward to a learning season in 2014 and a second place in class in the Roberts Cove hill climb. Next season 2015 absolute disaster with the bike refusing to run properly at all and getting lapped constantly I eventually reached a low point and retired in disgust from a race and flung my helmet across the garage. Only for my brother Liam who helps me usually on the Sundays of race weekends my bike would have landed on the ground. Eventually at the season end I diagnosed the problem as faulty carbs and promptly filed them in the bin. They were replaced with a filthy set I acquired from Hogan motorcycles in Nenagh and ended the season with another second place in class in the Roberts Cove Hill climb 2015. Next season 2016 I began to get back to enjoy my racing again with an winter engine rebuild by myself ( first time building a 4 stroke )and struggled to get results with a slow bike and running second hand slicks due to lack of funds, it was a frustrating season in some ways as I believed I could run closer to the front on better machinery. I also had my first win at the Roberts Cove hillclimb. And the 2017 season was much the same with very limited funds but ended on a high note as I found myself leading a race for the first time in the last meeting on 2017. The race was a wet race and I was leading easily from series winner Brian Murphy on his Ducati and couldn’t believe how easy it was. Then red flags put an end to that. The race resumed, Brian set off like a scalded cat and I got a bad start but after dispensing with Robin Heatcote I set about chasing Brian. With only a 3-lap race it was a big ask but I caught him at the last corner. Brian put me in my place in 2nd but I couldn’t complain finishing the season on a high. I finished the 2017 season in third place in the championship so happy with that considering the bike I was on. The only downside to the season being David Morans accident (we had become good friends through racing and were plotting what we were going to do for the 2018 season with some trips up north). Dave still has a long road to recovery but is making progress. Now for the big news! I purchased Tim O`Kennedy’s very nice YZF750SP in October and am hoping for big things for myself and the bike for the 2018 season. 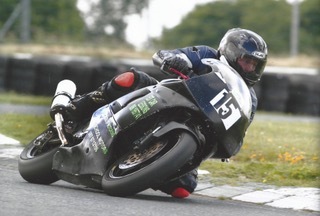 The bike holds the class record on the international track in Mondello plus I am also hoping to do a round of the F1 championship up North during the summer, funds permitting. I could badly do with some sponsorship to fund my season this year especially with entries and tyres, so if anyone would like to help me out and have your name on a very trick bike please contact me on 0861957741 anytime. Any sponsorship small or big would be appreciated.